Going paperless seems to be one of the top new trends among law firms due to cheaper and better hardware and software, refined processes, and effective consulting. And it is especially important for paralegals to know the do’s and don’ts of implementing a paperless office as they may be the ones in charge. So why are so many firms going paperless and how is it done effectively? 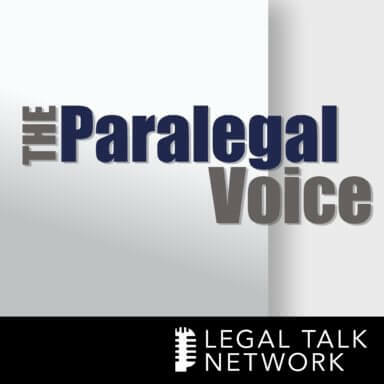 In this episode of The Paralegal Voice, Vicki Voisin interviews practice management advisor and former paralegal JoAnn Hathaway about why law firms should go paperless, the risks and perils of improper execution, and the important role paralegals play in this process. Can a law firm or business actually go completely paperless? JoAnn L. Hathaway works for the State Bar of Michigan as a practice management advisor. She previously worked as a litigation paralegal, a legal liability claims director and risk manager, and a legal administrator. JoAnn is an Adobe Acrobat Certified Expert, and holds software certifications in LexisNexis Time Matters and Billing Matters software. She is active in the ABA Law Practice Management Division, serving on the Publications Board and the State and Local Bar Outreach Committee. JoAnn is a frequent speaker on law firm technology, insurance, and risk and practice management topics. Advertiser: Welcome to the Paralegal Voice, where you hear the latest issues and trends in the world of paralegals and legal assistance by one of the best known paralegals in the industry, Vicki Voisin. A paralegal for more than twenty years, Vicki is dedicated to helping legal professionals reach their goals. You’re listening to Legal Talk Network. Vicki Voisin: Hello everyone, welcome to the Paralegal Voice here on Legal Talk Network. I’m Vicki Voisin, the paralegal mentor and host of the Paralegal Voice. I’m a NALA Advanced Certified paralegal, I publish an e-newsletter titled Paralegal Strategies. I’m also the co-author of Professional Paralegal, a Guide to Finding a Job and Career Success. You’ll find more information at ParalegalMentor.com. My guest is JoAnn L. Hathaway, a former paralegal who today is a practice management advisor for the State Bar of Michigan. She previously worked as a legal liability claims director and risk manager, and also legal administrator. JoAnn is an Adobe Acrobat Certified Expert, and holds software certifications in LexisNexis, Time Matters, and Billing Matters software. She is active in the ABA Law Practice Management Division, serving on the Publications Board and the State and Local Bar Outreach Committees. JoAnn is a frequent speaker on law firm technology, insurance, and risk and practice management topics. She’s going to be just the perfect guest for today’s topic. Welcome, JoAnn. JoAnn L. Hathaway: Thank you for inviting me, Vicki, it’s a pleasure to be here. Vicki Voisin: Thank you so much for giving your time and I know our listeners are going to just love this topic that we have today. Before we begin, though, our sponsors should be recognized and thanked. That would be Boston University, offering an online certificate in paralegal studies. If you’re seeking a professional credential or just want to further develop your skills, Boston University provides an affordable, high quality 14 week program. Visit ParalegalOnline.bu.edu for more information. That’s ParalegalOnline.bu.edu. Our next sponsor is NALA, a professional association for paralegals providing continuing education and professional certification programs for paralegals at NALA.org. NALA is a force in the promotion and advancement of the paralegal profession and has been a sponsor of the Paralegal Voice since our very first show. And Serve-Now, a nationwide network of trusted, prescreened process servers. You should work with the most professional process servers who have experience with high-volume serves, embrace technology, and understand the litigation process. Visit Serve-Now.com to learn more. The goal of the Paralegal Voice is to discuss a wide range of topics important to the paralegal industry and share with you leading trends, significant developments and resources you’ll find helpful in your career and also your everyday job. Guests are usually included to help explore timely topics and for that reason, I’ve invited JoAnn Hathaway to be with me today to discuss the issue of going paperless. We’re going to talk about going paperless in a minute, but first JoAnn, I’d like for you to tell our listeners about your journey from paralegal to practice management advisor with the State Bar of Michigan. JoAnn L. Hathaway: Sure, I’d be happy to address that, Vicki. My journey actually began in a healthcare setting, believe it or not. While I was getting my paralegal degree, I worked in healthcare and after graduating, I then worked as a legal administrator and then as a paralegal for a large law firm. I worked primarily in litigation. One of our litigation clients was actually a medical malpractice insurance carrier. And after working on their matters, they realized that I had both a legal and medical background and they then hired me as a claims consultant to oversee medical malpractice claims. After a period with the company, they decided to launch a legal malpractice book of business, so I migrated to that arena eventually overseeing claims and conducting risk management consultations to basically assess the risks a potential insurer might bring to the company. And at that time I also furthered my education. I obtained a bachelor’s degree in management and a master’s degree in administration. And then the last loop was when the state of Michigan decided that they wanted to launch a practice management department and they hired me to do that for that. And so here we are ten years later. Vicki Voisin: Wow, that’s really great. And our listeners always like to hear about paralegals who have used their skills and moved in to different areas, so I love your story. What I’d like to know, though, is what exactly is your role as a practice management advisor with the state bar? Are practice management advisors available at the state bars or most states? JoAnn L. Hathaway: Well, I’d be happy to address that. A lot of people are not familiar with practice management advisors or PMAs as we’re often referred to. So in my role as a PMA here at the state of Michigan, I work with the membership and their staff as it pertains to what I’m going to refer to as the procedural or the business component of running a law firm. I’m sure you’ve heard and know that lawyers are training to be lawyers in law school and not business owners. So in our particular program here at the State Bar of Michigan, we offer services in a number of ways. We offer a very dedicated practice management website with how to’s and guides and resources and to do lists. We also have a free helpline where people can call in with their practice management questions. We have and conduct law firm consultations, we have lending libraries, we have training session seminars, webinars, and a monthly practice management column in our Michigan Bar journal. Now with regard to other Bar associations, there are a number of other programs in North America. Each of the programs I would say hey might vary slightly in what they offer, but there are also many similarities as well. We’re a pretty tight knit group and we’re always conferring with one another, sharing information, ideas and resources. And it’s always really good to have other people to get information from. So if any listener wanted to see if there was a PMA in their locale, all they need to do is Google, “PMA of North America,” and we do have a dedicated landing page with exclamations and also a directory of all the programs in North America. Vicki Voisin: That’s interesting, I didn’t know that. And I’m also curious, you said that on the state Bar’s website – well first of all, are they articles and tips and so forth that the practice management has here for the state Bar? I just want to add that the state Bar’s website is very user friendly and so I was wondering if they would be able to get to those. JoAnn L. Hathaway: They would be able to get to those. That information is not password protected. And in fact, many other resources that are available, for instance retainer agreements, sample disengagement and engagement agreements, those are provided in Word form. So a member can actually download those and tailor them to their specific needs. Vicki Voisin: That’s a wonderful resource. But we need to move on to the topic today, JoAnn, and that is the issue of law firms going paperless – or as some people would say, less paper. I know that through the years – and I’ve worked as various firms – I know that we’ve had closed files in off site storages which were not inexpensive. We’ve had basements full of the banker’s boxes full of files. They would get dusty and musty and people wouldn’t return them to the right place and then it was impossible to find them and this has gone on for years and years. Now that we’re trying to change the system a little, I’d like to know if it’s really possible to go paperless. JoAnn L. Hathaway: I do believe it is. There is always that ongoing debate where as many people as you talk to, you get a many different opinions. But you can certainly have less paper and I for one tend to be as a belief that you can go totally paperless. Also, really with a paperless practice, it can be whatever you want it to be. It’s your call, there’s really no right or wrong. So I believe the imperative component is the firm has the processes, hardware and software in place to actually gain the benefits of a paperless practice. Vicki Voisin: Why should law firms go paperless? Tell me about that. JoAnn L. Hathaway: There’s more and more competition in the world of lawyering than ever before. People really need to have the edge, as I might refer to it, with having a paperless practice. Now when I’m talking about the competition, as you know, there are a lot of online services and even the local competition and lawyers always need something to separate them from those competitions. And going paperless can help them do this. With the efficiencies that can be required from going paperless if it’s done right, it can help them in instrumental ways. No stacks of paper or boxes, just total efficiency. Also think of having everything immediately at your fingertips. This really provides an advantage with the ability to convert wasted non billable time to billable time. And also, I might add to that with all of the available Cloud computing that is available now, every firm, regardless of size, I believe can afford to go paperless and can successfully accomplish it. Vicki Voisin: Well I’m sure that, as you’ve said, it’s going to save time and money as you get this up and running. Are there any other benefits? JoAnn L. Hathaway: Well, the time and the money component is huge in many respects. For more billable time to need for less HR to need for less storage space as you’ve just mentioned a moment ago to reduce office supply needs and more. But some other benefits can include the ability to be much more mobile. It’s all about mobile lawyering, that’s nothing new. People can work from anyplace at any time, provide better client service because they have everything, information accessible at their fingertips right away without having to go pull that paper file and physically be in the same geographical location as that file. And this just results in a better quality of life for the involved attorney and staff. Much less stress wit efficient streamline services. Vicki Voisin: There have to be some risks, so what would those be? JoAnn L. Hathaway: There are a lot of risks and I’m not trying to scare anybody off here because I am a huge proponent in the paperless law practice. The firms need to recognize what I refer to as the top ten perils of not doing it right. So these will identify those risks, so I will quickly go through these top ten perils. Peril number one, lack of a written paperless policy. Peril number two, implementation failure due to inadequate hardware and software. Number three, putting the cart before the horse thinking the work in progress and what I see basically making it up as you go alone. Number four, this is a big one: haphazard document naming conventions. We’ve all been there where everybody has their own little naming protocol. And when you’re dealing with digital documents, this can basically result in a black abyss. Another big one, peril number five: poor or absent search mechanisms resulting in the inability to find documents. Number six, failure to define process as assignment of duties, timelines, resulting in gaps that measures by whoever is working in the system. And number seven, we’ve just talked about mobile lawyering and there are risks associated with that. I identified how helpful a paperless program can be, but if you have unencrypted devices or laws that are unsecured, data and devices, it can be obviously a huge peril. Number eight, poor security measures by way of knowledgeable IT support and backup. Number nine, process breakdowns due to failure of tests; define, refine and ability to restore information. And number ten, last but not least, failure to have a monitoring system in place. Vicki Voisin: Is there usually one person in charge of making all of this work? It’s confusing and I know that there are people in a law firm who might not be too excited about learning all of this. So is there usually one person? JoAnn L. Hathaway: I’d say yes, that is my recommendation. I find that a lot when I go into law firms where people don’t know who the go to person should be. And in this, for lack of a better title to give this person, I really think there needs to be a commander in chief of this paperless paper. So pl have one conduit, they’re going to one person who’s calling the shots and oversees and continues to basically improve the program as need be and to guide people along through this process. Vicki Voisin: So ay a law firm has decided for sure they’re going to go paperless. What’s the first step that they should take? JoAnn L. Hathaway: I think the first two steps, Vicki, would be to determine what it is they’re trying to accomplish and how it’s going to benefit the firm. And once that has been determined, those involved have to determine why is it in the best interest of the firm and then educate the firm members to get by in. I’ve always said when I talked to people about implementing paperless programs. I found that it’s not the process that’s usually the problem but the people. So obtaining support and enthusiasm is a vital component in implementing a vital paperless practice. And to highlight more about those processes and implementation techniques, I would say plan, reduce to very detailed writing, include the steps involved from going to paper to digital. Make individuals accountable and assign specific responsibilities. People need to have ownerships and they need to know what they are responsible for. And then last but not least, assign a timeline for accomplishment of the daily tasks for converting from paper to digital format. Vicki Voisin: Okay. Now when firms start this, will they already have the necessary equipment to go paperless or are they going to have to make an initial investment in maybe some new equipment? JoAnn L. Hathaway: I would say generally they do not have what they need and they would have to make an investment. This is what’s imperative that a firm before they start on their paperless quest that they ensure that they have all the hardware and software that they need to successfully launch their practice. They need to identify all the particular needs and obtain and test all of the hardware and software that they either have or will be getting and using before beginning to scan that first document. People may have what they need or at least a portion thereof, but it may not be dated. It may not be working well and it may not be able to accommodate in the capacity that they need. Vicki Voisin: So what specific hardware are you referring to? What specific hardware do they need? JoAnn L. Hathaway: Again, that’s going to vary firm by firm. But I can certainly say that at a minimum, obviously there are reliable computer systems, printers, copiers, shredders. This is where it’s very important to have either multiple or large monitors. Because if people are reviewing documents online, they don’t want to have to be switching back and forth from one application to another. That’s very counterproductive to a paperless practice. They need to have good backup hardware. And most importantly, good scanners. Also, they need to check and ensure they have good IT support to determine their server needs, network switches, and other such hardware needs. Vicki Voisin: What about software? JoAnn L. Hathaway: I did want to add just for a moment if I might, I did want to add about the scanners before moving on to the software. I believe it’s really a must for all personnel to have a scanner on their desktop. There are numerous great scanners out there on the marketplace today with a wide variety of functionality. Many times when I go into firms, they have these multipurpose machines, a copier, a scanner, a fax, and those have a purpose and a place but those are not at all efficient for use in a paperless law practice. Except for the very large volumes of discovery documents or something that a smaller scanner could not accommodate. With regard to software, obviously productivity software such as Microsoft Office, that’s very important to have up to date and place. PDF creation software and there’s a lot to choose from out there. Not only PDF creation software, but people need to familiarize themselves with PDF manipulation. For instance, Adobe Acrobat is just one of many and can do so much with PDFs and in the paperless law practice it’s going to be very important to have the ability to work with PDFs. Document management software is another integral software application for a paperless practice. Billing and accounting software, practice management software, and last but not least a search software application. Many of these applications can integrate and synchronize with one another so that it’s something that should be taken into consideration when someone else is shopping for a new software. Vicki Voisin: Okay, JoAnn, before we move on we’re going to take a short break to hear a word from our sponsors. But when we come back, we’ll continue our discussion about becoming a paperless office with my guest JoAnn Hathaway, practice management advisor for the State Bar of Michigan. Advertiser: Are you looking to advance your career? Do you know someone who wants to enter the paralegal profession? Boston University’s fully online certificate in paralegal studies is a fantastic option. It’s affordable, takes just 14 weeks to complete, and is led by accomplished faculty who teach employer-focused skills like legal research, writing, technology, and more. Visit ParalegalOnline.bu.edu for more information and to download a free brochure. That’s ParalegalOnline.bu.edu. NALA means professional. NALA offers classroom and web-based continuing education at professional development for all paralegals. NALA’s certified paralegal credential has been a gold standard of professionalism for over thirty years. More than 15,000 paralegals have this certification, and nearly 2,000 have achieved the demanding advanced certified paralegal. NALA works actively with others in the legal field to promote the value of paralegals and to advance paralegal professionalism. See more about why NALA means professional at www.nala.org. Vicki Voisin: Welcome back to the Paralegal Voice. I’m Vicki Voisin, and my guest today is JoAnn Hathaway, practice management advisor at the State Bar of Michigan. Now, JoAnn, before we took a break we were discussing the issue of going paperless and the equipment a firm would need to do that. Now I’m wondering if you have any tips or suggestions for the one thing that you said was really important and that’s getting all staff on board for the process. JoAnn L. Hathaway: I do, Vicki. I think it’s imperative to the success to have buy ins from colleagues and staff and even the resistance of one person can seriously lessen the chances of success. We’ve all encountered that one person in the firm who said we’ve always done it this way, why would we want to change it. And some people just don’t deal well with change. Plus people are attached to paper. It’s tangible, it’s familiar, and oftentimes people don’t want to give it up. So this idea of change often provokes anxiety in a firm. I think to be a role model is the first step. The paperless leaders that we talked about before that should be identified in the ifrm need to be positive role models. They should be in a position of authority in the firm and acknowledge that the process may experience some bumps along the way and that is probably going to happen and they are not going to be pointing the finger at anyone in particular. But also point out that the outcome would be well worth the transition. And also I would add that the next tip is to really involve your staff. It shouldn’t be – I don’t think – a dictatorial type of scenario. Staff should be involved with the paperless planning process from the outset. And I think that their involvement should be continuous and their opinion should be solicited and heard. In fact, these are the folks that often have their hands in the process all day long. And they have a wealth of information so they should be heard. And it’s no secret that when people have ownership at stake, they are much more likely to push for a successful outcome as compared to when they are merely told what to do. So it’s really beneficial for everyone to ensure that the whole team has buy in and that there’s uniformity. Vicki Voisin: I have another question about figuring out this process, and I know you’ve talked about a policy and I want to address that in a minute. But where does a firm find the information that they need for equipment? Hardware, software, what steps to take. They can’t come up with all of this by themselves, so is there a reference for this? JoAnn L. Hathaway: There are really a lot of good publications that are available today. Those that come to the forefront are several paperless publications that are available to the law practice division of the American Bar Association, one should start there. If someone wanted to contact me, I could point them specifically to some of those resources that are out there, but there are several good paperless reference materials. Also, I might point out another resource. TechnoLawyer has a blog, has an archive where they have several good categories of information associated with going paperless to include naming conventions, needed hardware and software, so those would be two references that I might be able to suggest. Last but not least, for those people who are listening, I have mentioned that there is a directory of practice management advisors across North America and if you have someone in your jurisdiction, you certainly should call your practice management advisor for some one on one assistance. Vicki Voisin: Tell me about the specific policies, is that how to name documents, who’s going to scan, all of that. I know it has to be extremely detailed. JoAnn L. Hathaway: It does have to be extremely detailed and that’s almost another podcast in and of itself. But to me, this is the most important component of the equation. You wouldn’t build a house without a blueprint, so you shouldn’t begin your paperless process before you have something in writing. It should be extremely detailed and it shouldn’t include just what is to be done. It should have a how to, this is where we start and how and when it is to be done and who is responsible for each step. You don’t want people pointing fingers saying I thought you were doing that. People need to know what they are responsible for. We talked about a person in an authoritative position. It also needs to appoint a person who has authority over the plan in process. In essence, again, this is the person that people should go to with questions, suggestions and ongoing oversight of the program. Vicki Voisin: So, JoAnn, how can paralegals play an important part in the transition to being a paperless law firm? JoAnn L. Hathaway: I believe paralegals can play an integral part in a law firm paperless plan. They’re most always much more hands on with the day to day operation in a law firm than the attorney members. So assigning the paralegal to lead a taskforce and oversee the launch and ongoing monitoring of a paperless program I think would be very helpful to a firm. Also, a paralegal could be of great assistance to measure to the extent possible how going paperless has benefited a firm and its clients. JoAnn L. Hathaway: I do, Vicki, I have two tips I’d like to address and this is the need to choose your hardware and software together. Synchronization and compatibility are essential to a paperless practice. This is not when you want to have a cobbled together program. So address your needs, research what’s available in the marketplace, consult with your knowledgeable IT personnel and set a budget. Tip number two would be to ensure everyone is trained in usage of the hardware and software before going paperless. Oftentimes, support staff are more proficient than a firm’s attorneys and everyone needs to be proficient to ensure a successful outcome. When I go into firms I often see and hear complaints of attorneys and sometimes staff indicating that a system is not working or they don’t like the software. Often it’s because of a lack of training. So people in a paperless office do need to ensure that they know how to retrieve documents, they know to convert to a digital format and essentially ensure success of their program. Vicki Voisin: Okay, those are great tips. I really appreciate that. I think sometimes law firms attack issues like this piecemeal and they might buy a scanner for one person but not all of them. But buying that hardware and getting them all set up before you even start is just a great idea. So, JoAnn, if our listeners want to get in touch with you, how can they do that? Vicki Voisin: Thank you. JoAnn, this has just been wonderful information and I know a lot of people are curious about making this work. Some have, some are just thinking. So great information, I really appreciate your joining me today. JoAnn L. Hathaway: Well thank you, it’s been my pleasure, VIcki. Vicki Voisin: We’re going to another short break but don’t go away because when I come back, I’ll have news and career tips for you. Advertiser: We’re glad you’re listening to Legal Talk Network. Check us out on Facebook, Twitter, and LinkedIn too. Vicki Voisin: Welcome back to the Paralegal Voice. At this point in the program, I have some career tips for you. These career tips, practice tips, whatever you want to call them, are little ideas I hope you will take back and use them; really think about this. So when your firm decides to make changes to their system – and there are many changes. Going paperless is one of them, new technology, different staff, there are all kinds of changes that take place. So don’t be the person that says it won’t work. You may have some really good reasons and you may try to withhold your support, but that’s not the idea. You need to get behind the project 100% and make every effort to make it work. Do some research, learn the system. Maybe help write this policy that JoAnn Hathaway was talking about. We’re going to use that system so that you can train other people. And what you also should do is ask others – maybe from other law firms as you do your networking – ask them for their tips on going paperless. There’s a learning curve for everything, and often it really does seem impossible when you begin. If you think you can’t learn it or that it won’t work, you’re just setting up this whole process for failure. You can learn anything if you try. And if you’re willing to put in the time to learn it. And paralegals especially should support these management decisions. That’s all the time we have today for this episode of the Paralegal Voice. If you have questions about today’s show, please email them to me at [email protected]. And also, don’t forget to check out my blog, ParalegalMentor.com/blog and the resources available on my website, ParalegalMentor.com. All of these have been designed them to help you move your career in the right direction, and I have to tell you, that’s always forward. This is Vicki Voisin, thanking you for listening to the Paralegal Voice, and reminding you to make your paralegal voice heard. Advertiser: The views expressed by the participants of this program are their own, and do not represent the views of nor are they endorsed by, Legal Talk Network, its officers, directors, employees, agents, representatives, shareholders, and subsidiaries. None of the content should be considered legal advice. As always, consult a lawyer. Thanks for listening to the Paralegal Voice, produced by the broadcast professionals at Legal Talk Network. Join Vicki Voisin for her next podcast on issues and trends affecting paralegals.